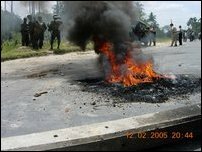 A Sri Lanka Army (SLA) post at Meesalai-Puttur junction in Thenmaradchchi was set alight by protesting youth provoked by SLA soldiers who attempted to remove roadblocks protesters setup as part of hartal. 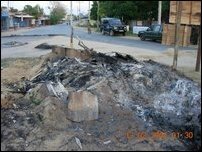 Police retaliated by ransacking a community center. 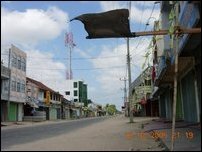 Tension spread to Kodikamam when a Police vehicle injured a civilian while the vehilce was negotiating a roadblock during Saturday's hartal and protest, civil sources in Jaffna said. 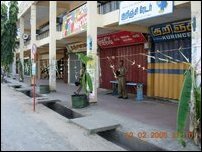 Sri Lanka police officers who came to the Meesalai junction to disperse the crowd used teargas on the crowd. The youths retaliated throwing stones at the Police and set fire to the SLA sentry point located at the junction, according to witnesses at the scene. Police baton-charged and hit pedastrians with their guns injuring several of them, sources added. 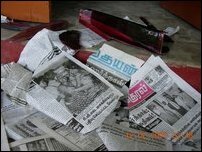 The police also entered a community center near the Meesalai-Puttur junction tore-up news papers carrying news stories on the Hartal and destroyed more than 20 plastic chairs inside the main community center hall, according to residents using the center. 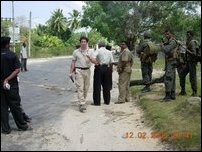 Members of Sri Lanka Monitoring Mission (SLMM) came to the scene at around 11 am and used binoculars to observe the events from a distance. 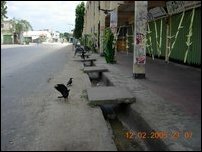 Meanwhile, almost at the same time at Kodikamam junction a youth received injuries to his head when a police vehicle attempted to cross the road blocks set by the protesters. The youth has been admitted at the Chavakachcheri hospital and the injuries are not life threatening, hospital sources said. 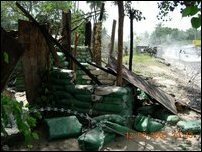 Sri Lankan Policemen went amok and destroyed a Community Centre located near Meesalai Puttur junction. 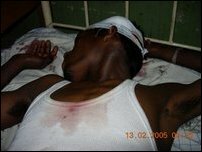 Injured civilian admitted to the hospital. 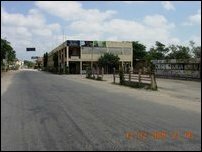 The person was injured by a Police vehicle in Kodikamam.